I recently read Eating Animals, by Jonathan Safran Foer. It’s not a book that I would have gone out of my way to read. (That was my nice way of saying I find him intolerable-ish.) I won it in a giveaway, it sat on my bookshelf for a while, and I finally decided to give it a chance. Although I’m an omnivore, I have read some vegan books in my day (The Face on Your Plate and The Ethics of What We Eat: Why Our Food Choices Matter), so most of what Foer had to say about factory farm conditions and the moral implications of eating meat weren’t new to me. I think the strength of his book—and something I could relate to acutely as someone with dietary restrictions—was his discussion of the real social impact of having a limited diet. Frankly—for me, at least—it’s a hard thing to articulate without feeling like a whiny brat. Food is inherently social and deeply rooted in tradition, especially this time of year. No revelation there. The harder part is that opting out of the mainstream diet—for whatever reason—can feel like a denial of tradition. I have particularly vivid memories my mother’s three-hole cake, a frugal (vegan, it turns out!) chocolate cake recipe that came from an index card written in my grandmother’s handwriting. It was no nonsense and elegant in its simplicity: a good cake. Making and eating it with my mother said something about our shared heritage (poor, white, scrappy). But, now that I don’t have that cake, what do I have? I know it sounds melodramatic, but really. I think, as Foer seems to, that having a variety of eaters at your table (even the dreaded vegans and gluten-avoiders) is an opportunity for tradition to evolve, to widen. With that I offer you a new, more shareable tradition: a free-form tart with balsamic braised onions and a sage-y (ha!) cashew cream. I am hoping—really hoping—that you don’t make this and wish it had goat cheese and sausage all over it. By all means, serve it next to the goat cheese and sausage if you need to and, for the love of god, talk to people about what they ate and what they eat now. It’s as important as what’s on the table. You’ll only use about half of this for the tart. Leftovers are great on roasted beets, whipped into mashed potatoes like you’d use heavy cream, or as a topping for the finished tart. 1. Puree all ingredients in a blender until smooth. Refrigerate until ready to use. This tart dough recipe is from my Rosemary Pear Galette. 1. Stir together oat flour, millet flour, tapioca starch, xanthan gum, and salt. 2. Prepare a cup of ice water. 3. Cut the shortening into chunks then incorporate it into the flour. If you don’t have a pastry cutter (I don’t!) just use a fork. You’re done when the shortening is evenly blended and you have mostly small pea size chunks of flour/fat. 4. Using a tablespoon, gradually add cold water, just until the dough comes together. For me, 2 T was exactly enough. 5. 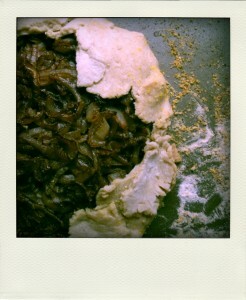 Refrigerate the dough for 20-30 minutes while you prepare the onions. 1. Over medium heat, saute the onions in the olive oil until they begin to brown and brown bits begin to form on the bottom of the pan. 2. Reduce heat to low and add the balsamic vinegar to the pan, using it to scrape up any brown bits from the bottom. 3. Crank in the pepper and cook on low until the vinegar is fully absorbed. 4. Let cool while preparing the crust. 2. Roll out the dough to somewhere between 1/4 and 1/8 inch thickness using your preferred method. I rolled it out between two sheets of floured wax paper. 3. 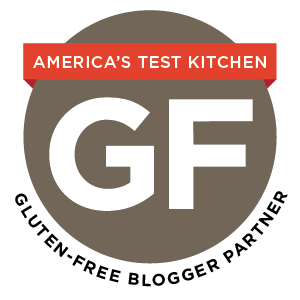 Sprinkle gluten-free cornmeal (if you have it) on a baking sheet and transfer the rolled out dough to the sheet. 4. Use a spatula to spread a about half of the cashew cream onto the dough, keeping it 1 1/2-2 inches from the edge. 5. Place the balsamic onions on top of the cashew cream. I used all of mine, but use your judgment and err on the side of under-filling. 6. Gather the edges up around the filling however works best. You could pinch it together or fold small sections over. 7. Bake at 350 degrees until golden, about 30 minutes. Store it in the fridge if you’re not going to eat it within a day or so.